This week, we are highlighting Colette Pewsey as an all-star Sales Development Representative! 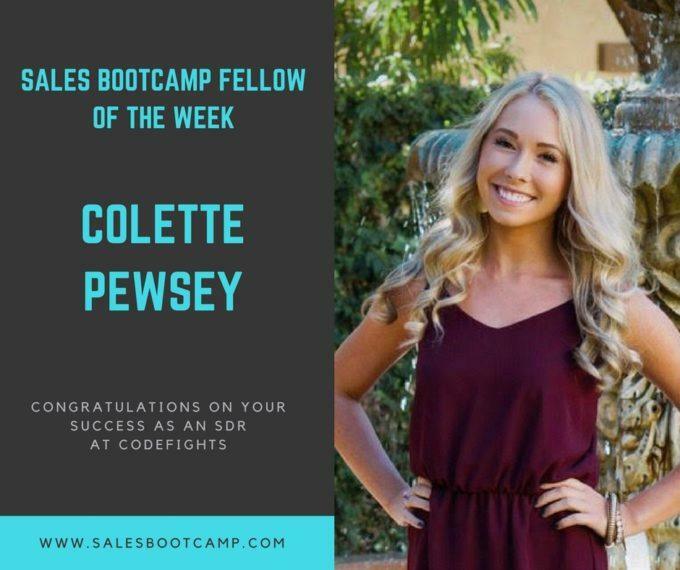 After going through our fellowship program, she was recently promoted at CodeFights- all of us here at Sales Bootcamp are so proud of her! In her first 5 weeks as an SDR, she set up 12 qualified meetings from outbound campaigns, which far exceeded her quota. She highly impressed her managers right from the start and has proven herself to be a valuable asset and key player in her company. Our Sales Bootcamp Fellowship Coaches helped Colette by providing ideas for innovative approaches to her sales leads. She saw the most success from our coach’s suggestion of a multi-channel approach. She created outbound email sequences, reached out to prospects on LinkedIn, and went above and beyond my making tailored videos. She would record herself explaining a company’s specific issue and how CodeFights could be their solution. In this video, she would record herself at the bottom of the screen while showing herself browsing through the company’s website and LinkedIn, explaining CodeFight’s value and how they could benefit. She made individually tailored videos for specific companies, as well as a generic video that she sent out to a wider range of leads. After seeing much success from this technique, she even had several other Sales Bootcamp Fellows reach out to her for advice and best practices. Congratulations, Colette, and keep up the great work! The Sales Bootcamp team is rooting for you.